In this first part of a series I present a simple shader that can be used to generate different leaf shapes. In later articles we will add shaders that produce the veins of the leaf. The leaf shape shader is essentially creates one side of a leaf from a cubic spline and mirrors that to the other side to create a symmetrical shape. The spline that is used has four controls. 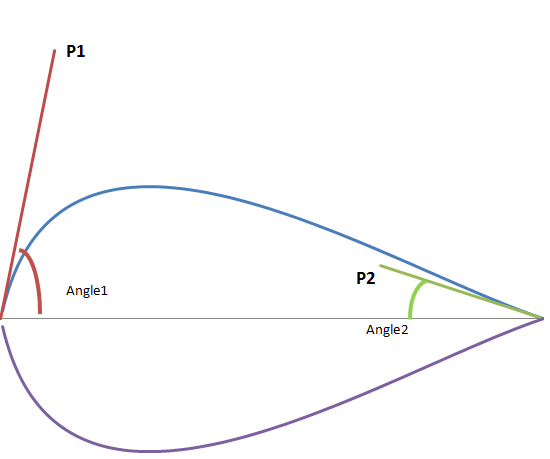 It starts on the left in the direction of P1 and ends on the right coming from the direction of P2. 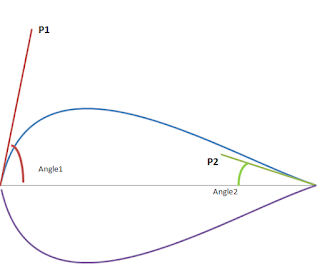 The lenght and angles of the vectors going to P1 and P2 are inputs to the shader. Some of the shapes you can create are shown below. Note that it is also possible to define a shape that crosses itself in which case the behavior of the shader is undefined. The annotated code for the shader is shown below. It includes a small library of functions that will be reused by shaders that will appear on this blog in the near future and this include has its separate page where you can download it and find installation instructions. As you can see there is nothing fancy going on here. 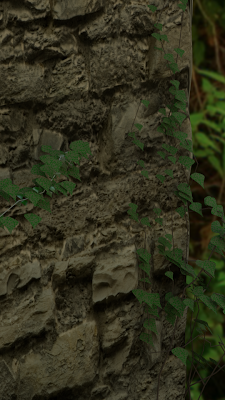 The leaves are simple squares with a reset uv-map and a mapping node is used to position the leave onto this square (in this case rotated 90 degrees). The output of the shader is then used to drive a mix shader which shows some green material where there is a leaf and a fully transparent material where there isn't. The sample image at the beginning was create with the IvyGen addon. The leaves it produces are simple square faces that are not connected but nevertheless consist of a single mesh object. Because we want to orient each individual leaf a bit different we need a random number for each leaf. We therefore have to separate each face into its own object. Go back to object mode. Each leaf now is its own object we our leaf material attacthed. The green part adds a small random rotation around the z axis to each uv map. This will be different for each individual leaf. The actual rotation is done by another OSL shader (given below) because the vector mapping node cannot be driven by inputs. The red part maps the rotated uv to the correct position before handing it to our leaf shader. This mapping is necessary because the squares created by IvyGen are sort of centered on the vines and we want our leaves to protrude from the vined instead of being pierced by them. The blue part is just a simple mottled green shader with some gloss. In a next article I will show how to add veins to the leaf shapes. Hmmm all my typing gone because of Wordpress and its sad caching mechanism. :-/ Might cause other comments to go awry. Anyway: short version... well done. Look forward to using this on Sapling.